Danny King is gunning to regain his British Championship despite a horrific injury that nearly ended his career. 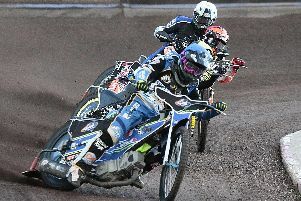 The exciting new Sheffield superstar was run over by German Michael Hartel last season leaving him with a broken arm and extensive nerve damage. But King, 32, believes he is now 100 per cent fit and ready to get back to the top of the sport for Great Britain and the Tigers. He told The Star: “If the operation on my arm didn’t work I knew that was it for my racing career. “It was worrying. It didn’t dawn on me until just before the operation. I’d been told that if it wasn’t a trapped nerve, then they would look at a nerve transplant. And there was no guarantee a nerve transplant would work. “So, it hit me then. Because if I couldn’t get any more feeling back in the arm, there was no way I would ever ride a speedway bike again. Fortunately for King it was a trapped nerve and his movement has increased dramatically since the New Year - he believes he’s now fully fit. He added: “I had no strength at all in the arm after the accident, yet a couple of weeks ago the doctor in London signed me off. “It’s been awkward. I’ve been lucky enough throughout my career to avoid injury so the last year or so has been very hard. “It was a freak injury and I just want to hit the ground running and get back to normal with Sheffield. “I’m gunning for my British title back, 100 per cent. I had a brilliant 2016, had a great Cardiff British Grand Prix and got a silver medal for Great Britain in the World Cup. “It’s been difficult to slip off the radar for riding for my country. “People don’t really mention my name now and that’s hard to take, I won’t lie. “But I’ve just had to be patient with the injury and deal with it. I believe in my talent and what I can do. I’m very determined to get back into Team GB and being British Champion. “It’s just a hurdle and I seem to have got over that now. I am ready to get going. “The injury has made me very hungry to succeed again. I struggled last year because I was still going to meetings and it was difficult to watch my teams without being part of it. Speedway ace King is renowned as one of the most exciting British riders and admits signing for Sheffield is a “match made in heaven”. Owlerton fans can look forward to King’s swashbuckling racing style, there’s rarely a dull moment when he is in a full flow. With King joining Kyle Howarth and Ty Proctor in the Tigers team, it promises to be one of the most entertaining top threes in the sport. He said: “I’ve been on the bike four times already now, just back from being in France for two days testing and I feel absolutely superb. “In the end it felt like I’d never been off a bike, considering I’ve had seven months off that’s amazing I feel fully fit. “Everyone knows I love to race on the bigger tracks, that’s what I’m all about. When I got the call from the Bates boys to say they were interested in signing me, it felt like a match made in heaven. “To be able to race a track like Sheffield every week is a dream come true. “It’s a new era for everyone at the club. The Tigers have already been tipped by many experts to regain the Championship title they won so emphatically, ironically against Danny King’s Ipswich side two seasons ago. 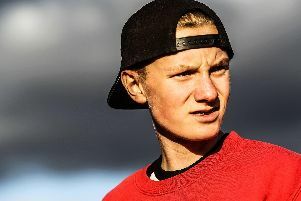 With an excellent top end plus the likes of hot prospects Broc Nicol, Zaine Kennedy, Drew Kemp and Kasper Andersen, it really is a mouthwatering line-up for the Steel City fans. King added: “It doesn’t bother me that people are tipping us to win the Championship. I know some might think that can be a curse. “Speedway is such a hard sport to predict. So much luck is involved in winning titles, staying injury-free, peaking form at the end of the season for the Play-Offs. “All we can do is race hard and win races. The first aim is just to make the top four and the Play-Offs, then go from there. “Then you need to treat the last four meetings as almost a new season. “But Sheffield have done that before with the team of two seasons ago and this new side certainly has potential to do it. “People can say what they want, I’ll go and do my business on the track. My results will hopefully speak for themselves. “We’ve got a team full of that attitude. Yes there’s a lot of hype about but we know it’s business as usual.